My entire life I would have told you in an instant “I’m not a runner”, but this mama of four is learning a new skill. I’ve been training with my 8 year old twins to run in a 5k. We’ve been at it for a few months now, though I’ll confess that we’ve been stuck in week 3 of the C25K app for a bit now. Between weeks of sickness or traveling and taking days off it’s been tough. I keep having us repeat Week 3 Day 3 over and over again… Don’t worry I think next week we’ll finally be ready for week 4 day 1. As we get into the swing of running on a regular basis I was thrilled when Jabra emailed and asked me to test a pair of their sport bluetooth headphones. I remember getting my hands free attachment a number of years ago that was Jabra, but haven’t heard much about them recently (not that I’m into that much techy stuff though). Researching just a bit, I realized that Jabra is still a leader in the bluetooth industry. Overall from 1-5, I give it a “4”. I was pleased with the comfort when I was wearing a hat or a bike helmet only. I found it difficult to fit well with running glasses. The onle difficulty I had was the strap connecting two ear pieces. When my neck got sweaty, the material the strap is made of would stick to my neck making it uncomfortable and began to pull on the ear pieces in my ears. If I find that there are no electronics or this strap is not needed I would remove this strap. Someone with a large head will have difficulty wearing them with strap. But I still give a 4 out of 5 rating for fit. The sound quality was as good or better than any device in this price range. I got it connected to every Bluetooth compatible device I own (iPhone 4, iPod Touch, iPad) without any hiccup. Very smooth which I liked. I was shocked by how well the FM transceiver worked. When working out in the gym (solid concrete walls) I was still able to pick up stations. The receptivity of the Bluetooth connection was very good. Even when I walked away from device left on equipment 10′-15′ away. I did not say away long but never lost signal. All in all I would say that they would make an awesome gift for a guy. So if you are pondering birthday or even Christmas ideas this is worthy of making the list. Wanna win one? 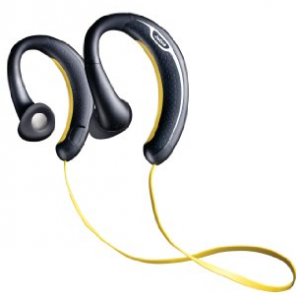 One Southern Savers reader is going to win a Jabra Sport Wireless Headset. Leave a comment below telling me when you would wear your headset – I wear mine on the morning run. This giveaway is sponsored by Jabra but all opinions are 100% my own. The winner of this giveaway will be chosen and posted to the Giveaway Winners Page Thursday, 8/15.